One of the important things that Melanie Diezel stresses to all content marketers is to make sure they’re not just sharing the content they want to share, but to ensure it’s the content their audience wants – and needs – to receive. Sticking to your strengths and the medium that you’re passionate about as far as how you send that content out – whether that’s a blog, a video, a graphic – is just as important as the content itself. And making sure that content is realistic and consistent for your audience will determine if you will keep their attention to get them coming back for more. Rich: She is the founder of StoryFuel, which consults with brands looking to create, expand or optimize their branded content teams, processes and practices. 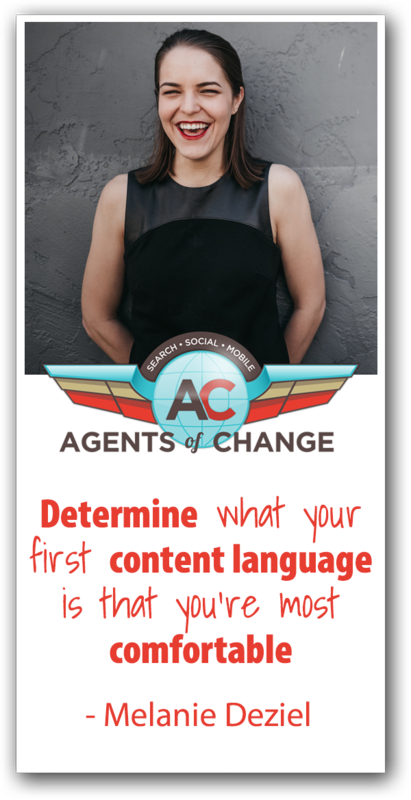 As a speaker, she travels the world giving keynotes and corporate workshops that teach marketers, publishers, creators and companies how to create the best possible brand storytelling. Prior to founding StoryFuel, she was the first editor of branded content at The New York Times, a founding member of HuffPost’s brand storytelling team, and served as Director of Creative Strategy for Time Inc’s, 35 US Magazines. Welcome to the AOC podcast, Melanie Deziel. Melanie: Thanks for having me here. Rich: So how did you get drawn into the world of content marketing, and when did you know you were officially a content marketer? Melanie: That’s a really good question. I think for me it was mostly accidental, if I’m being totally honest. I started out as a journalist, so I studied investigative reporting and arts and cultural criticism, and I definitely thought I was going to be on the editorial side of things working in a newsroom or at a magazine or somewhere doing editorial type of content creation. But I graduated at a point when a lot of newsrooms were downsizing – as many of them have been – as everything has been going digital. And I found that I needed to put my same skills as a content creator to use in a different environment. There was actually a very smart recruiter who pointed out to me that the skills I had as a journalist, as a reporter, as an editor, would be incredibly useful on a lot of business teams that were looking to build these kind of content units, so to speak. These little mini brand newsrooms. So she was wise enough to redirect me to this new line of business, this new opportunity. And that’s how I found myself at HuffPost and later at the New York Times and Time Inc, working as a content strategist and a brand content creator in those publishing environments for all of our brand partners. Rich: So you still don’t consider that to be journalism, you’re thinking that’s already content marketing at that point? Melanie: You know I think so, definitely. I was definitely not working in the editorial environment. My job was firmly planted in the marketing/advertising/sales departments, and I was solely and exclusively working on sponsored content for brands at that point. So usually it falls more under the sub-niche of content marketing of native advertising. So, sponsored content that lived on these published platforms. But no, I never was creating content of my own accord or assigned by an editor. I was exclusively creating content for brands. Rich: I see. Now you talk a lot about creating a scalable plan for content marketing. Melanie, what does that mean exactly? Melanie: It’s different for every brand I think. But one of the biggest challenges I have found when I’m working with brands who are trying to start their own content practice, is creating something that’s going to be sustainable. When we look at a machine like the New York Times or HuffPost or some of these other publishers that we might think of, they’re creating so much content on a consistent basis and that can be really intimidating if you are a brand starting a blog or a brand newsroom, and you feel like you’ve got to keep up content creation on a weekly basis or a daily basis if that’s not your primary skill set or your primary offering. So many times that’s a really big fear. How do we create something – create a practice – that’s going to continue. To create content in a consistent way so we’re not going to disappoint our audience. So we’re not going to have them coming to find something and finding nothing new. So what that means is creating something that’s realistic, that we have the resources to execute on, and that we have the passion and desire to execute on. It’s kind of that magic combination. And so for some brands that might mean putting out content every single day on certain platforms. For other brands with fewer resources, that might mean putting out content once a week or every other week. And I think finding that sort of magic point of what’s right for you really is a personalized experience of looking at those resources and looking at that passion and desire to tell stories. Rich: So to be clear about this, we’re talking about businesses that could be anything from a CPA, to a sandwich shop, to a web design company, companies that wouldn’t traditionally be media empires. But you’re suggesting that to play in the content marketing sandbox you need to start thinking of yourself that way, but maybe you’re not going to have the resources to go head to head with the New York Times or Fox News or any of these giant news resources, correct? Melanie: Exactly. So if you’re a CPA, one of the things that just like if you were IBM, your audience has questions, they have challenges, they’re trying to learn more about the thing that you’re doing, and they may require some education in order to really work with you in the most efficient way. So being able to create blog posts that explain your expertise, that showcase your expertise, not only does that help position you as an expert to your audience, but it makes you more discoverable through search if people are looking for answers to the questions you’re answering. And it helps, again, position you as an expert and someone they can trust and hopefully do business with as well. So even if you feel like you’re just a tiny shop or a solopreneur, there’s a lot of benefits of putting content out there and being more discoverable and adding more value to your audience. Rich: So I’ve talked to a few people on this podcast before who publish very successfully but very infrequently. Is there a minimum amount of publishing that we can do and still succeed in content marketing? Melanie: I have to confess that I am guilty of this. This is something that I’ve fallen into that trap as well. Which is hard because then I’m not practicing what I preach. Rich: They plan to create great content, but very infrequently. So I’m just curious, do you have to do it once a month or does it really just depend on your business? Melanie: Well I think a lot of it depends on your business but I think the most important thing I always tell folks is, I would rather see you be consistent and focus on the quality in a consistent way, than focus on quantity. So if that means you only have the resources to create one awesome video a month or a really in depth quarterly report, I would rather see you do that than pump out a cruddy blog post every week that you’re not proud of and that your audience doesn’t gain anything from. So even if it means you’re going to be a little less frequent, if what you’re putting out if something that serves your audience and serves your business, and again it’s something you’re proud of because it’s actually useful, then I don’t necessarily mind it being less frequent as long as there’s some consistency there. What is tough is when you have, ok this month I’m putting out 3 blog posts, and next month it’s one video, and then there’s a whole month of nothing. Your audience doesn’t really know what to expect. It would be like think of your favorite magazine if it only came in the mail sometimes, and you never knew when it was com. It would be pretty hard for you to justify subscribing and to feel like you’re getting some value because you never know what you’re going to get or when. So as long as you’re communicating with your audience in a consistent way, and they know when to expect it, I think that it’s more important to focus on that quality and consistency, than necessarily on the quantity. Rich: I hear what you’re saying, but I’m sure a lot of people listening are sitting there and just saying, “Yeah, that sounds great but my work load gets in front of me”, or they might be thinking, “That’s great for you, you’re a great writer but I’m not creative” or “I can’t come up with ideas, I’m not talented enough”. You must hear things like this from people, what do you say to these people? Melanie: Oh my gosh I hear that constantly. It makes me a little sad. I think we’re all creative people. I think one of the things that is unfortunate in your life – and I don’t know where this comes from for everyone, I think it’s probably different – at some point you were told you’re not a creative, or you’re not a writer, or you’re not a math person, or you’re not an athlete, whatever that thing is. Whatever the case is, these are skills that we can practice and we can learn. If you’ve convinced yourself that you’re not a creative or you’re not a writer, and you never make that attempt and you never feel comfortable trying, then that’s definitely not going to change. If you acknowledge that many times the reason that creativity or creative endeavors are scary is because we don’t have a process behind it. If you sit down at your desk and you say I’ve got to come up with a genius blog post today, and you give yourself 10 minutes and you’ve got nothing, well then that’s probably going to be very difficult. If you set a plan in place and you can give yourself some confines and say I know I want to create specifically a video and I want it to be about this kind of thing. I want it to be DIY, just walking people through steps and a process. Then all you’re asking is not how do I come up with a genius video, but what’s something I can teach my audience in a video of 3-5 minutes. And that becomes a much easier question to answer. Some of the most prolific creative people are people who do their habit regularly and gives themselves those kinds of confines. So you can actually create for yourself an environment where you can be more creative by giving yourself some limitations and guardrails as you’re doing it. And I think that makes a big difference. It helps transform creativity and storytelling and ideas from this serious muse or this spark of genius that you can’t wrap your head around or feel like you don’t have a creative process with steps and instructions. And that makes it a lot more approachable for most people. Rich: I like the idea of having a strategic approach or specific steps that you take, and I want to come back to that. But I feel like a lot of people are content experts in terms of their own business, they’ve been doing this so long, but they can’t always express that content. How do you feel about bringing in an outside source? Like a copywriter for a blog post would come in and interview you and then write your voice. Or even kind of talk somebody through and have them creating the videos of the podcast for you. Is that ok or is that something where, no, you really should be creating your own content? Melanie: Not only is that ok, I think it’s really, really smart. I understand, for example, basically how my car works, but I wouldn’t necessarily trust myself to fix it. So I think it’s totally ok to engage an expert who’s going to help you tell the story in the way that makes the most sense for you. The other thing that I really encourage people to do is try to determine what is your first content language, what’s the content language that you’re most comfortable. For me I really love to write, that’s where I feel I’m most productive and able to create the most stuff. But I also don’t mind speaking, I’m happy to come on a podcast or I speak on stage quite often. So I know that those are two areas that I can be very fluent, that I can create a lot of content quickly. I’m not so fluent in video and I’m not great at designing, so those are two things that I struggle with. So for me, even if I want to create those things that I struggle with – a video or design – I’m going to lean into the content languages I know best, speaking or writing, and then find someone that can help me translate it in a way that’s going to make sense. So for me maybe that means that I’v got this really cool idea for a graphic, I can’t design it, that’s not my skill set. But I’m going to write it all out and describe exactly what I’m looking for and find some links to things I like and share that with a designer in the language I’m most comfortable with, so that they can turn it into something that works for me. And you may find the same thing. Some of your listeners may be totally comfortable explaining what is wrong with some part of your industry or how to fix a problem, but maybe the idea of writing you just kind of get stuck when you try to write. So maybe you just talk into your phone and you record yourself talking about it for 15 minutes, and you send that file to a writer that can sew it together and turn it into a great written piece. That’s probably a much better use of your time to lean into that content language that’s most familiar, and let someone else do the polishing to turn it into the format you need it to be. Rich: I think that’s a great point and I’m just going to admit something. I love to write, I’ve been writing all of our content for flyte new media and Agents of Change for years. We’ve got a great copywriter who we work with and for the first time ever as we’re revamping our own website, I’ve asked her to write. And she’s like, “I can’t write in your voice”, and I told her to just try. I’ll add a layer of sarcasm when you’re all done. But the bottom line is, I haven’t written a blog post in like a year and a half that’s not justa video of me on the local TV station talking about something in the tech arena. Which is not really great blog content, it’s not in alignment with what we do, so I finally just bit the bullet and now I’m bringing in somebody who I know will interview me and get that content out of my head. For me it’s easy to do podcasts. I love talking to people like you, Melanie, who have this fresh approach and all this great stuff. I can do that day in and day out, but it’s that whole other piece where it’s like, even though I love blogging, I can’t seem to find the time. So if you’re listening out there and you don’t feel like you can write or podcast or anything but you are a content expert, like Melanie said, please go to somebody that can take it out of your head and spin some gold out of that straw. Melanie: And just fo the record, you can absolutely take a transcript of this and a copywriter could easily turn that into a blog post. So that’s a perfect example of what we’re talking about leaning into the fact that podcasting comes super easily for you and now you have this audio asset that can be turned into all kinds of things. A designer could listen back to this and create 5-10 social graphics with different quotes or states that we might mention in this conversation. So it’s really easy to repurpose content. But like you said, you’ve just got to find that expert who’s really fluent in the particular content format that may not be your strong suit. Rich: I love that last idea about finding somebody who may be a graphic designer and having them create something out of this. You mentioned earlier about having a system in place so you don’t have to wait for that magical muse to come down and smack you in the head with a great idea. Do you have any steps that you have seen are effective, do you have any tips to develop this system to take some of the mystery out of this content creation? Melanie: Yeah, absolutely. I actually created what I call the “content matrix”, it’s available for free on my website, so if you go storyfuel.co/contentmatrix, I’m sure we’ll be able to share that link. What I’ve done is sort of given you a grid where on one side it lists out different formats. So some of the examples we listed here – audio, written, vieo, etc – and then along the top edge it lists a bunch of different focuses. So things your content might be about, such as a deep dive on a single topic, an interview, a feature about a person, a profile of a person, product information, a bunch of different focuses like that. So what you do then is you can choose any intersection of some of those formats and some of those focuses, and it gives you a prompt. So instead of saying I need an idea today, I know I’m doing written content so maybe I could do a written interview. Huh, who could I interview? Suddenly that’s a much easier question to answer that just coming up with something out of nowhere. So I have found that this content matrix provides a ton of prompts to kind of give you some starting points. And I always tell people every format and every focus may not be a thing for your particular business with the resources that you have, but it at least gives you somewhere to start. Rich: Ok, alright. That’s a good segue. Now creating content is one thing. Obviously we’ve talked about some of the challenges and some of the opportunities there. But getting it in front of the eyes of our ideal customers is another. Does your content skill ability have any tactics to make sure that this content gets seen, or is it more focused on just creating the content in the first place? Melanie: So most of my focus is generally on creating the content in the first place. That’s one of the areas where I feel I can add the most value. There are a ton of experts out there who can speak at length to ways you can use, even just a single platform like Pinterest, there are experts who can tell you every trick and hack in the book forgetting as much traffic as possible out of Pinterest. That’s not my particular area on expertise, so I try not to overstep my bounds, but in general you do want to think a little bit about how to get your content out in front of people. And in many ways, by having multiple content formats and repurposing in a way we talked about, you give yourself the most chances to put it in places where it’s going to make sense. So you talk about this podcast justas an example, if it’s only audio then your only way to distribute that is through iTunes and Stitcher and those available options. If you do have a complimentary blog post that goes with it, well now you can distribute that anywhere that links are allowed. If you have an image, maybe you grab a headshot from me and that’s part of your image for this particular episode. Well now that’s something that you can post on Pinterest or on Instagram where images are the dominant format. So in many ways thinking about the different formats in which you can tell your stories will open up so many doors for you when it comes time to distribute that content and get it in front of the widest audience possible. Rich: You’ve talked a lot about what type of format or channel might be right for us, what’s our natural. Is it to speak, is it to write, is it to demonstrate. Still at the end of the day we’re creating content for someone else. How do we know what kind of content might be appropriate for our audience? Does that fit into the whole model of creating the scale content idea. Melanie: Yeah, definitely. I mean a lot of this content matrix that we just talked about is particularly about how to come up with the ideas and kind of overcome that internal barrier about whether you even can come up with enough ideas. But of course you need to take your audience’s preferences into account. I think one of the things that’s important is by using a matrix like this or by expanding your own belief and your ability to come up with ideas, it becomes easier to adapt whenever you do get information that says your audience is interested in a particular content type. So one of the ways you might try to find that out is I always encourage people to be a little bit of a silent observer. So spend time in the communities, in the twitter chats, at the events, etc, where your community already gathers, and see what it is that they’re sharing. If you connect with other experts in our area, what kind of content are they producing. What kind of content are your competitors producing. That can often give you a really good insight into what your audience is engaging with. Of course you also want to take a look at any sort of measurement capabilities you have, whether that’s as simple as seeing what types of posts on our Facebook page get the most engagement. Or as complicated as looking at your whole measurement suite on your website and seeing which particular posts, and blog posts, and pages are getting the most traffic and the most time spent, so you can really scale that evaluation based on what’s available to you. But just listening to your audience. And I think one of the most basic ways if you really are having trouble is just to simple ask your audience and say, “Hey, we’re thinking about creating this guide, what would be most useful for you?” You can make it a poll, you can make it fun. Ask them would you rather have a printed guide, a printed checklist that you can go through step by step, a video, or an audio podcast that you can listen to while you’re doing other things. It’s totally ok to ask your audience and I think in most cases as long as you’re listening to those responses. If they tell you podcast and then you give them a video, they might be a little upset. But as long as you’re listening your audience will actually feel like they have some stake in it, like you’ve asked them a question and they had some role in the creation of that content, it gives them something to look forward to and to feel like they had something to do with it. And that’s actually a really good thing when it comes to getting an audience for that content. Rich: Do you see small business owners and marketers making continual mistakes when it comes to content marketing and content creation? And if so, what are to two of the top things that you need people to rethink in their approach? Melanie: One of the biggest things that I see – and this is a tough one to overcome – but I see a lot of folks leaning into generics, and that can take a lot of different forms. Maybe it means that your Instagram page is full of stock photos, and if it’s full of stock photos than people can’t get a sense of who you are or your personality or your products. Because they just see these sort of generic images. Same thing for the blog, right? If your blog is simply saying, “Meet our team, here’s our products”, it’s just sort of at that most basic generic level, you’re going to have a hard time creating any sort of relationship with your audience that’s truly personal and differentiated. So kind of being a little too safe and a little too generic is probably a really easy one. But the good news is if you’re having a problem it is often that creativity barrier where we feel like we don’t know what we can say or what we can come up with. And so hopefully that’s something we can help overcome. I think the other big challenge that we see often is people being too focused on the messages they want to share, and not quite focused enough to your earlier point of what the audience needs to hear. Oftentimes the content we want to give our audience is not the same as the content that they want to receive, it’s a little bit like gift giving. The thing you think your partner wants may not be the thing they want for their birthday, and you have to often pivot and say, well it’s their birthday so where did they want to eat dinner or what did they want to do. You kind of have to have that same gift giving mindset when you’re thinking about your content. Not necessarily what do I want to tell my audience, but what would my audience benefit from hearing, what would my audience want to know, to learn about, want to understand better. And if you take that audience-centric approach as opposed to thinking only in marketing messages you want to be outgoing, oftentimes you’ll see a reaction with better engagement with that content. Because it’s really serving the audience’s needs. Rich: Excellent. You had mentioned a resource on your website, and I’m sure a lot of people want to check out that, where can we send them? Melanie: You can learn more about me and my team at storyfuel.co. The matrix that I mentioned is storyfuel.co/contentmatrix. Nice and easy. And you can find us across the web in most places as storyfuel.co or storyfuel_co, whatever is appropriate for the particular network. And I’m Melanie Deziel so you can find me across the web as Melanie Deziel, I’m very SEO friendly, so you’ll find me if you look. Rich: Thanks, Melanie. I appreciate you coming in and I really enjoyed our conversation today. Melanie: Thanks for letting me share my story. Melanie Deziel helps businesses grow by showing them how to create marketing plans that work by using their strengths. Check out her website which includes a free matrix that any business can use as part of their strategy.